Live Clay with Wally Bivens! At Twisp River Pottery, a rural farm 9 miles up picturesque Twisp River. In this demonstration workshop we will talk while we work. We will examine the manner in which a dialog with the material can be a path to originality and “owning” the work. We will take a look at how a limitation can also be a defining parameter that leads to creative solutions and how ideas from other disciplines can be brought into the work. Wally will demonstrate working with thrown and hand built parts and discuss discoveries made when returning to a form over time, and incorporating those discoveries into one’s work. Live Clay will be held in conjunction with “Interpreting the Methow”, an exhibit opening June 8. 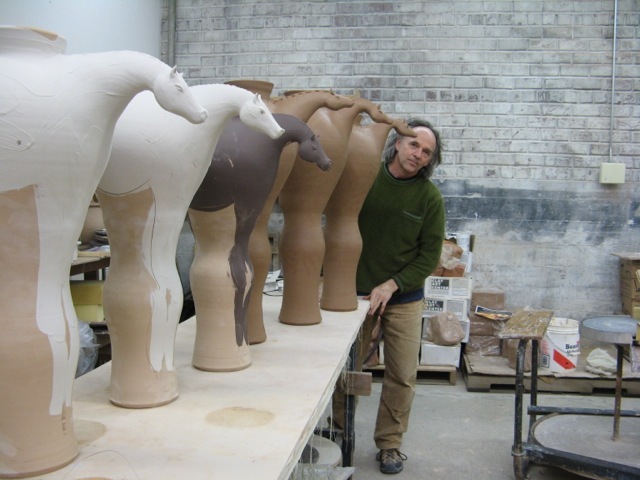 Wally Bivins will include ceramic horse/human inspired vessels during this show. A reception and slide lecture with Wally Bivins will be held Friday June 21 at Confluence Gallery and Art Center, 7-9pm.